Happy upcoming New Year, fighters! What is to be done with the New Year magic? After collecting a bit of New Year magic in matches, go visit Santa Claus at the friendly locations and exchange it for surprise boxes. Inside you can find one random item from the list: credits, Polymers, paint, container with implants, temporary high-quality weapon, services, some more New Year magic or even permanent green or blue weapon or armor! Alternatively, you can exchange New Year magic right away for services or a paint. Beside that, if you have accumulated a big stock of various excess PvE-tags try your luck and exchange them for a New Year’s gift box, maybe you’ll be lucky! For avid arena fans, Santa has kept a special gift. You can exchange PvP-tags for green grade weapons right away! 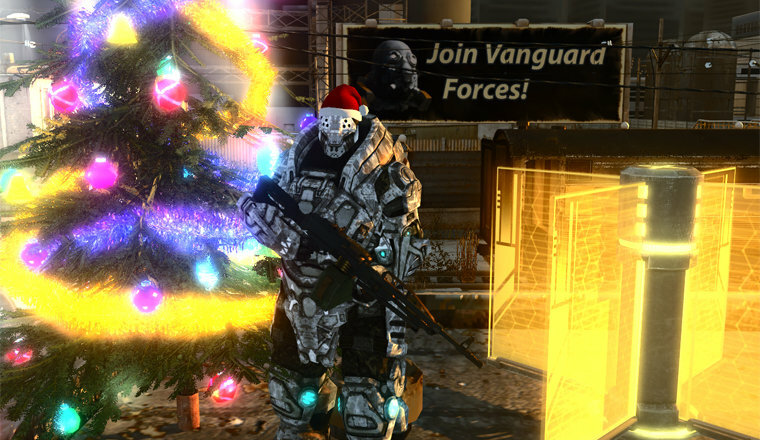 Also for the whole time of the holidays +100% experience and credits rewards at all game modes! And of course, a traditional medal to those, who meet the New Year in Lost Sector. ALL of the diamond weapons are available for the time of holidays! Now let’s proceed to the novelties. That's right, finally PvE pros have a celebration of their own. For the most badass contactors of the sector, we created a new super-tough contract “Raid: Icebreaker”. The Regulators' commander, better known as the "Icebreaker" has been sighted in the old city. There are legends about his impenetrable armor, which is charged remotely by some devices. To eliminate him, you will first have to deal with the charging generators. Each of them is carried by a squad of elite regulators, including the tamers. Luckily, if the "Icebreaker" will be attacked, these squads will arrive to support him, and will bring the generators with them. The squads' location is unknown and they might appear from any side. Beside the basic rewards for the quest, there is a tiny chance to find the Icebreaker’s helmet in his remains! It is that very helmet, the name of which we were choosing with your help a couple of years ago! And it’s name, obviously is – Icebreaker. Only for Juggernauts. For those, who would really-really want to get this helmet faster, there is also a slight chance to find it in the black boxes. Annihilators helmet can now drop from the Annihilator’s dead body as well! You like events with unequal teams like "Hunter"? You like events with buffs, like "Trial and error method"? You wanted an event with attacking and defending? Then meet the new event, the" defense of the triplex"! After the experimental "Triplex" robots got disassembled by some funny guys, the mercenaries guild found a new use for their details. The leftovers of the Triplex are assembled into three aggregates, which grant their allies buffs of mobility, damage and health. The purpose of one team is to protect these aggregates in the specified number of turns, and the others' is to destroy them. The attackers have numerous advantage, and the defenders receive the Triplex buffs. Every aggregate can be fixed once. The first launch will take place very soon. New heavy pistol for scouts, Russian OTs-33 “Пернач”. It is somewhat an evolution of the Beretta treeline, can fire bursts, but together with that it shoots with single bullets. It will become a great alternative to the steyr L-A1 for mobile scouts. Available for gold craft and rent. Russian machinegun PKP «Pecheneg» becomes the top of the third treeline of light machinegun (consisting of MG-36). Requires 12 level and according to that has a little higher damage and accuracy. Available for crafting and rent. Now the streets and hallways of old maps might have new destroyable covers. Power shields are folded at the beginning of the match, but when activated they unfold into power columns, behind which you can hide from bullets. Nevertheless, the shields are not eternal and can be destroyed. Yellow shields have 150 hit points, are activated for 20AP and block damage from large caliber bullets. Scout's ability "Dominating height" is renamed into "Height difference" and is applied not only by being higher for 2 or more meters than the target but for being lower as well. Some skills and stimulants that grant mobility now calculated differently. “Inspiration”, “Sprint”, “Fair verdict”, “Pull off the ballast”, "Callisto" light and concentrated pills now add mobility regardless of the current mobility. A machine-gunner with 60% mobility and a scout with 110% mobility will receive almost the same bonus. Priorly, all bonuses were being given according to the current mobility, and less mobile characters were being given a lower absolute bonus. Some bugs, allowing shooting with higher accuracy than intended, have been fixed. The minimal distance of shooting (closer of which - attacking is unallowed) has been increased. The higher the accuracy the weapon has, the closer it is to the optimal distance. It was planned that weapons with high accuracy, which are fired from close distance, will be taking a very big scatter. So let us have less happenstances - you won't be able to hit in close distance, so don't even try. The main server now supports all the languages that were in the second server. A special thanks to Snakefist for the German language corrections. The loading screens of "Industrial" by FerryMan and "Shooting range" by Roman500 have been added to the game. Take leadership over newbies, teach them how to PvP and benefit that! If in one party there is a veteran and a newbie playing together, everyone receives an "Academy" bonus +50% experience and credits rewards, and the senior veteran additionally receives the "teacher" bonus +25% BP. Newbies are defined as those who played less than 100 PvP matches and who have only one character in their account. Some of the most balanced events now add kills, damage and etc. to player's stats. Remember, having multiple accounts is forbidden and punishable. FN TPS and Benelli M4 receive additional powerful doubled fire mode for 60 AP. All machine guns have their vertical scatter decreased. This means, that they should start shooting more accurately at crouched targets. But not much, after all crouching - is a defense method. L-DASH's implant effect now cuts the maximum AP -120 with activation. You will notice that once you try to use an adrenaline before activating the implant. Kamikaze cocktail now decreases mobility. The reward bonus for each teammate in cooperative battles is doubled. The more people there are in party, the better (both for PvP and PvE). The basic reward in PvP id slightly increased. Bandleaders and raid bosses now have infinite ammunition. Now, in non-quest spawnings, there cannot be more than 1 band leader. The problem of forming a team in the training mode, which did not let correctly change players’ team, is now fixed. Now, after completing the beginner's quest "Radio jam", an experience boost will be given. The old New Year medals got the nasty line on bottom fixed. The chance to be ambushed when attacking a band without a contract is decreased. Map rotation for base capturing. Full distribution kit 109 here. Is that it? As for now, yes. However, the upcoming year is going to bring more new items than the passing one. Small and less small new items await you every month!